A dive into dark waters, into unexplored territories at the outer fringes of consciousness. "Doorways" opens up into subtle spaces that evolve and spiral through your mind in unpredictable patterns. A pure dark electronic ambient exploration, it demands your full attention and rewards it with forbidden sonic caresses from the forgotten corners of reality. A recording that demands a clear decision: will I stay at the doorstep or will I step all the way through? 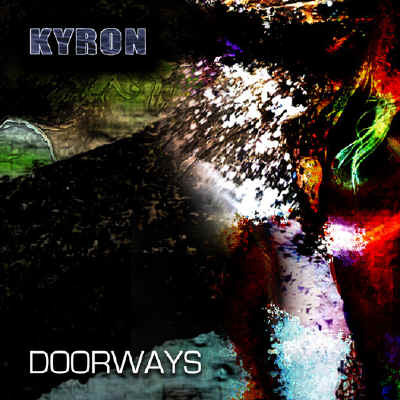 It's not the first time we review an output of the California-based project Kyron. The albums Whims vol. 2 and Fin de etapa already caught our attention in the past. The latest CD by JC Mendizabal, the person behind this project, can hardly be compared with his previous ones. Doorways is a 65-minute long apocalyptic score for a lovely psychological horror trip. The music constantly breaths an immense tension, the electronics used can be considered fear producing and the vocal samples on top of them seem to be from people struggling for their existence. Especially the second and third track are treathening in this way. The second half of the album is full of sci-fi sounds, larded with estranged voices. A trance-techno track can even be found at the end of the album, to prevent people from falling in a complete depression. For the stronger ones among us recommended.